The best way to get to know a community is by scheduling a tour. 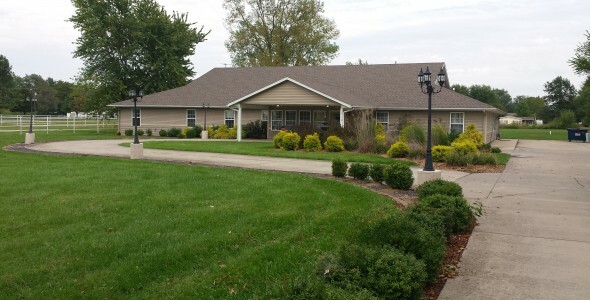 See the facilities, meet the staff and residents, and get a feel first hand what it's like to live at Life's Journey Senior Living - Pana Assisted Living. A quaint modernized ranch style home in a quiet small town setting offers the perfect home for your loved one. Our foyer opens up to a spacious living room with beautiful hardwood floors and comfortable furniture. A fairly new addition of an expanded dining area with sky lights offers warmth of family dining and entertainment. Two fireplaces add ambience to the décor of home-like atmosphere in our two rooms perfect for visiting with your family member. The bedrooms are private with open closet area and a private bathroom complete with shower. Each room is carpeted and each one is individualized to accommodate your loved ones needs. Furniture can be furnished if needed. Our community has a beautiful outdoor patio area which is fenced to ensure your loved ones safety. A small garden is planted each year to add fresh vegetables and fruits to enhance summer diets. Our staff has outdoor cook outs utilizing our propane grill and picnics sitting outdoors at the tables provided which have umbrellas to shade the sun. This area is used also to sit out in the breeze while enjoying a delicious snack and beverage. All of our staff has completed the dementia training specializing in memory care as well as CPR training. Our kitchen staff has completed the food sanitation class as well as resident care specialists earning Food Handlers Certificates. Three home cooked meals and three snacks are provided daily. We invite families to join us monthly for a family dinner. We provide 24 hour nursing staff with experience in memory care. Our staffing ratio exceeds any other in the area. Monthly in services are attended by staff for continuing training purposes. Each staff member assists your loved one with their activity of daily living. We encourage independence and assist when needed. For convenience of your loved one, we offer in home therapy, lab draws, x-rays and a podiatrist. A beautician visits weekly to pamper your loved one with hair sets, perms and coloring.